In 2001, Disney’s California Adventure theme park was opened adjacent to Disneyland in Anaheim, California. The park was designed to resemble specific aspects of California. 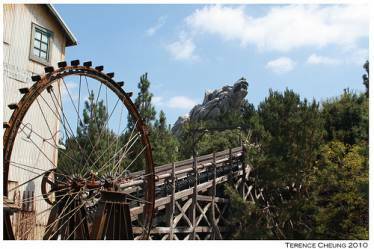 One of the major sections of the park is the Grizzly Peak Recreation Area, which features a ride called Grizzly River Run. Grizzly River Run is a popular river raft ride which lifts riders up a wooden conveyor and sprays them with water. With its wooden architecture, the ride has an old western feel to it. In keeping with the rustic nature of the ride, and much of the park, Portland Bolt supplied several thousand custom hot-dip galvanized square head machine bolts and square head lag bolts from 1/2″ through 1″ diameter. While Portland Bolt supplied square head bolts for several areas of the park, the largest area of focus was the Grizzly River Run ride. There were important deadlines for the contractor to meet, and with our ability to perform in-house hot-dip galvanizing, along with our heading capabilities, Portland Bolt was able to meet these demanding lead time requirements to help keep the construction schedule on track.